Fleetwood Mac News: NEW Unseen Rumours Tour Video Australia Nov, 1977 Fleetwood Mac "Oh Well"
NEW Unseen Rumours Tour Video Australia Nov, 1977 Fleetwood Mac "Oh Well"
Another piece of Mac history surfaced over night.... Oh Well performed in Australia November, 1977. Read the comments below by the video poster, head on over to Youtube, leave a comment and request what you would like to see next. This is awesome stuff!! 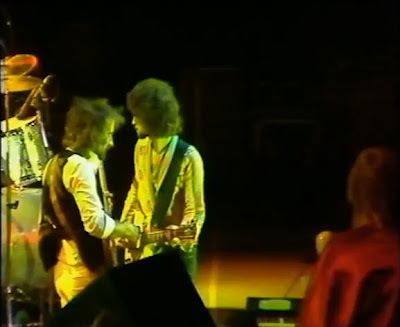 Here is another great track from the 1977 Fleetwood Mac 'Rockarena' tour of Australia. This one is aimed at all the Lindsay Buckingham fans out there. Unfortunately this concert was not lit for television and this track had a lot of 'blackouts' for stage visual effects - not good for the tv camera's. So I had to do a lot more editing (and did it at a higher quality).so hopefully you all will approve. The next track I will work on will be either a Stevie or a Chrissie. Well it keeps me off the streets eh! Here is the whole concerts track listing; maybe you choose? Yes, Rhiannon next, but really we want it all. But I look forward to seeing them all..
NOW this is Lindsey Buckingham worth listening to...!!!!! Stevie Nicks... Vamping it up! Must Read: "In Defense Of Stevie Nicks"
Stevie Nicks Goes Glee - Tomorrow! Review: New York Times - "Seeds We Sow"